United Talent Agency is in negotiations to acquire The Agency Group, according to Billboard. UTA has a solid film and television roster, including Johnny Depp, John Cusack, Kevin Hart, Sigourney Weaver, Seth Rogen, and Will Ferrell, but its music division could use a boost, particularly after the exit of a few notable pop/rock clients earlier this year. In recent years TAG, headed by CEO Gavin O’Reilly, has been on an acquisition spree, which could prime it for purchase. TAG’s Nashville office, run by Nick Meinema, boosted its roster in 2014 when it purchased The Bobby Roberts Company. Additionally, the company has been building its divisions focused on branding, EDM, Latin, casino, college and corporate events. Today, the local office represents Aaron Tippin, Aubrie Sellers, Austin Webb, Benton Blount, Bill Anderson, Big Bad Voodoo Daddy, BJ Thomas, Blackjack Billy, Bobby Bare, Casey Jamerson, Chris Janson, Collin Raye, Confederate Railroad, Connie Smith, Cowboy Troy, Dallas Smith, Dean Brody, Deana Carter, High Valley, Jaida Dreyer, James Otto, John Anderson, John Conlee, John Michael Montgomery, Kentucky Headhunters, Kevin Costner & Modern West, Lenny Cooper, The Lacs, Logan Brill, Marty Stuart, Mel Tillis, Merle Haggard, Pam Tillis, Pauly Shore, Restless Heart, Sam Lewis, Sammy Kershaw, Sarah Ross, Sundy Best, Taylor Hicks, and Walker McGuire. TAG is also home to the Black Keys, Guns N’ Roses, Muse, Paramore, Nickelback and many more. 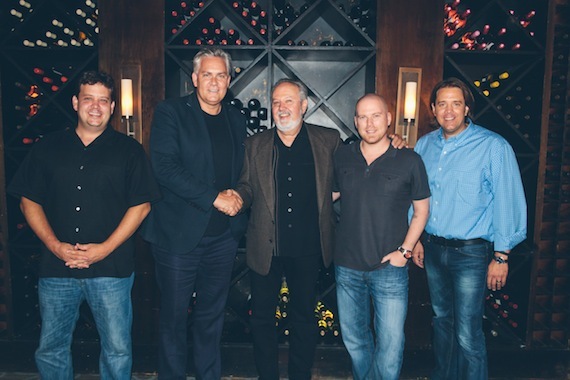 Photo from The Agency Group’s 2014 acquisition of The Bobby Roberts Company. Pictured (L-R): Travis James, Gavin O’Reilly, Bobby Roberts, Nick Meinema, and Lance Roberts.